With it's 26-inch rear wheel, the Annihilator P-Series trike is fun to ride and fast on the road. It's a great alternative to the Catrike Expedition for those riders that want to sit more upright. 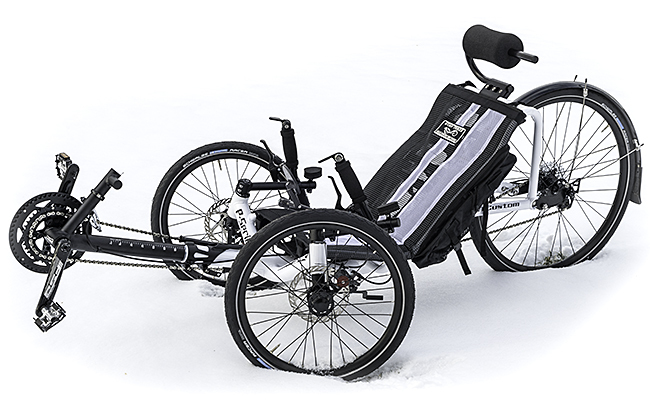 The Catrike Expedition has been one of our most popular trikes for years. It's light, it's fast, and it's a lot of fun to ride. That's why we chose it as the base for our very first Annihilator, the X90 (now X-Series) trike. Now we've created the P-Series Annihilator built with the Pocket Frame and the results are in. IT ROCKS!!! We've still got a huge range of gearing options to choose from, but we've toned it down a bit choosing to keep the twenty-inch front tires to keep the size and weight down. 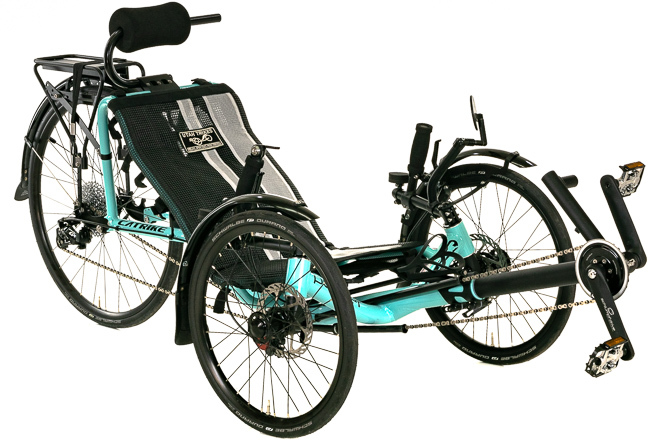 You'll find that the UTCustom Catrike Annihilator P-Series trike is most like the Catrike Expedition, with a few differences that we've had many people ask about over the years. While some of our gearing options might seem a bit over the top, we have found that trike riders like to have lots of gears. An increased gear range will make it easier to climb hills and enable you to go faster. We have both standard derailleur gear options with the best efficiency as well as internally-geared transmissions for the ultimate in reliability and ease of use. Front and rear gearing can be combined to give you the best of both. The Annihilator P-Series features the UTCustom Performance Seat Mesh with an integrated cargo bag and insulated bladder pouch. The top of the seat has the UTCustom Super Headrest with Taillight Mounting Bar. Not only is the headrest adjustable and super comfortable, it allows you to mount your taillight easily on the highest part of the trike. All of our UTCustom Annihilator Trikes include our rear Extension kit with brake mount tabs. The optional rear brake can be used as a drag brake or parking brake with the friction lever setup or as a functional rear brake with locking brake lever (requires combining front brakes with dual-pull lever). 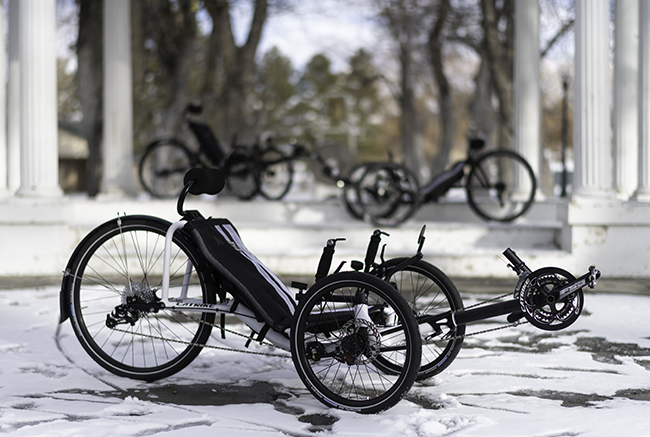 The Annihlator P-Series trike offers tremendous value to the rider. 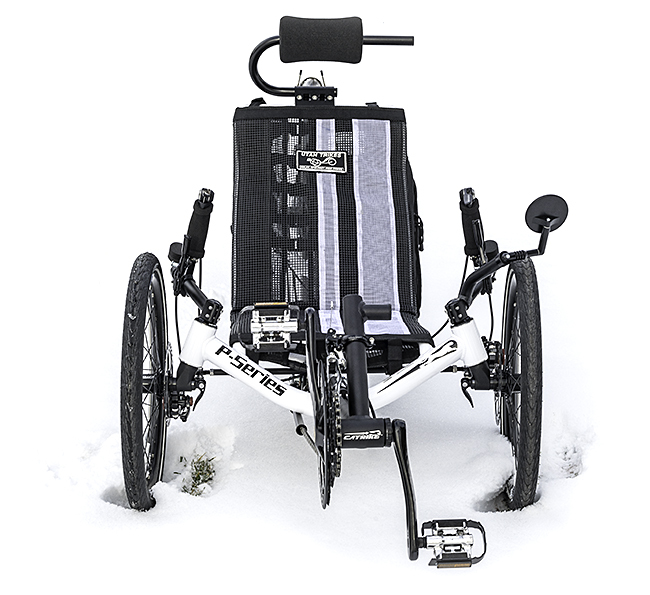 Built with the same high-quality components as the rest of the Catrike lineup, we've also added the UTCustom performance seat mesh with an integrated cargo bag, and also our Super Headrest with taillight mounting tube. The P-Series is narrower than the Expedition and also has a shorter wheelbase. This makes it a little more maneuverable and easier to travel with. Undoubtedly, the more upright seat will appeal to many. The stock 30-speed gearing has mountain bike low gears and road bike high gears and will likely be suitable for most riders. We have many options available for both front and rear gearing. We are building more and more electric trikes and the Annihilator P-Series is a great candidate for a motor. All of our motor kits allow you to choose the level of assist you want. That means that as you pedal the motor kicks in automatically providing additional power to your own pedaling efforts. We also provide a thumb-actuated throttle with our motor systems that act like the gas pedal in your car. Don't want to pedal? No worries, just push the throttle and go! We make our own custom battery mounts to keep the weight down low and near the rear axle. This keeps the weight of the battery from affecting handling and puts the battery in an easily accessible spot of the trike. All our battery systems come with an AC charger and a two-year pro-rated warranty. We make our own mounts to put the control console, throttle, and other buttons where you need them. Motor options are available through the configurator above in the FRONT GEARING and REAR GEARING sections. Need something custom? Just let us know!